Eventually it is possible to move nodes via Drag & Drop. After so many user requests I could not longer resist. Thank you for your feedback! The small buttons at the right side of the list let you drag an activity or a subtree and move it to another postition within the list. 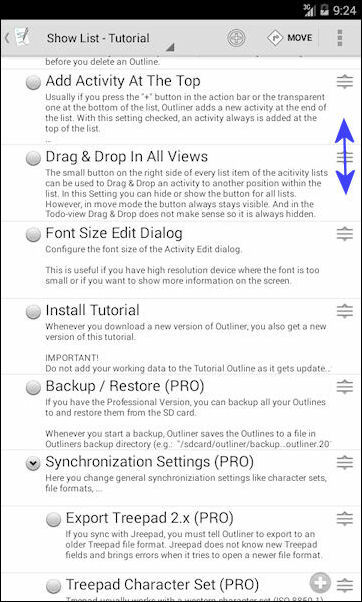 You can disable the new feature in the Settings "Drag & Drop In All Views". However, in move mode the buttons always stay visible. A long click on the '+' button at the bottom adds a new activity at the beginning of the list instead of the end. You can configure this behaviour in the Settings. Thanks a lot for this drag-drop sweeping to change sequence of entries. I was - very happily - surprised to suddenly see this - long awaited and "obvious" - feature appear after an update. THANKS. Thanks for this update. Please give option/include the feature of moving(drag and drop) for the LIST also. Manual sorting of the Outlines already is on the issues list. Sometimes, for a quick drop of an outline-node, and for not instantly forgetting what I was going to write down anyway, I just open any outline and add another node/task entry. However, I may then subsequently like to actually not only SORT the item in the list, but actually MOVE it to another outline ... by a new sweep feature. I was inspired by the "sweep-right" to move an item to the 'right' and make it a child of the above item, and the "sweep-left" to close a sub-tree. Well, could it be made possible to use a "sweep-left" to move a (closed) tree/task to another Outline altogether ?